Submit your tournament with us on our "Submit A Tournament" page. Here you can set up the time, date, course, sponsors along with many other tournament options. Ability to add your logo and tournament flyer to your own dedicated page on our site. Add your tournament description and even embed video on your tournament page. Now that your page is ready, it's time to sell "tickets" to your tournament. Everything from spots in the tournament to hole sponsorship will flow through our website. Save time by having all golfers book through our website. Save money with our low negotiated credit card rate. Foursomes are created as golfers pay, giving you the ability to move foursomes around or add players manually. Track your tournament income in real time as players continue to register and pay. Turn your golfers into your own sales force with our social media share feature! Also, as we grow, more and more golfers will search for tournaments to play in on our website. The tournament search feature will give you more visibility and the ability to get more registered golfers. 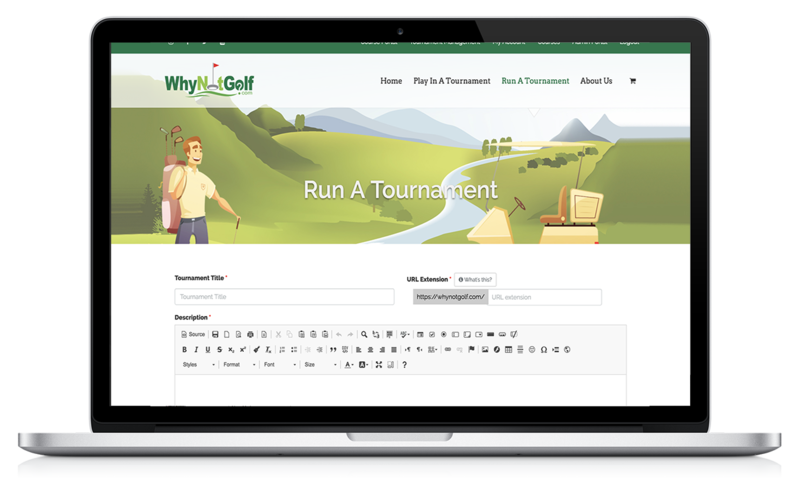 Every golfer who books through our site will receive a prompt to share your tournament at checkout. 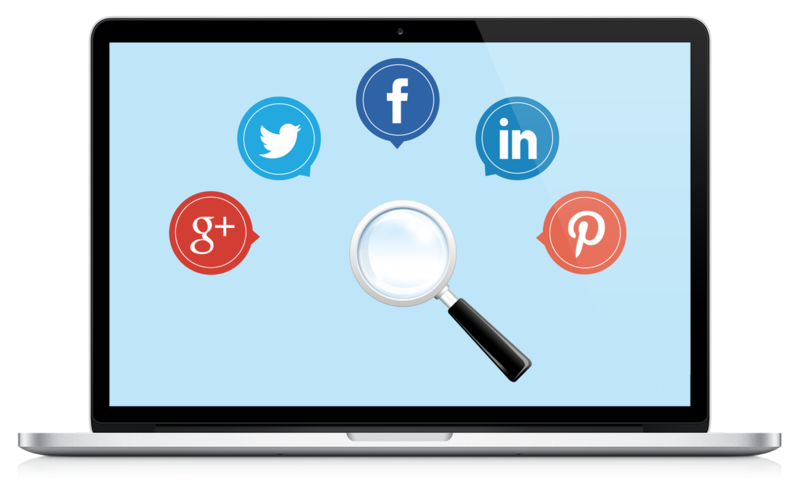 The ability to share on all major social media websites. Your tournament will be listed in our search listings so more golfers will be able to find you and play. Your tournament will reach many more potential golfers with these features. On the day of the tournament, download and generate your check-in reports via PDF or CSV file. This will save you time and keep you more organized. 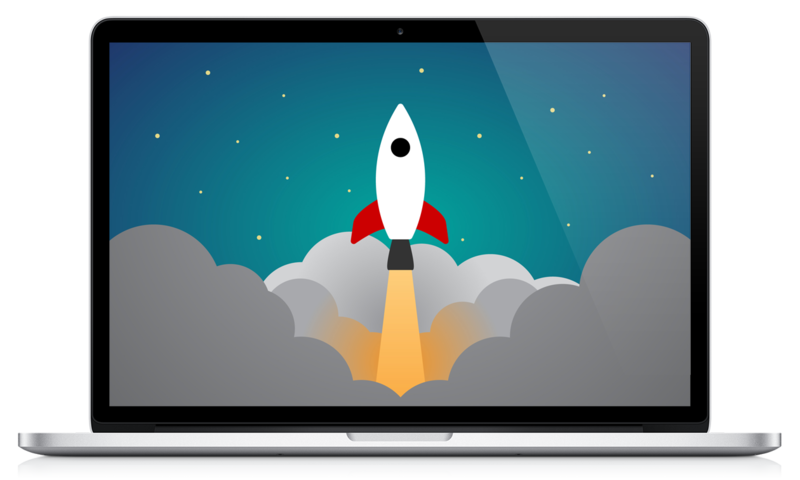 Easily see who has and hasn’t paid on check-in reports. All reports are sortable so you can easily find each player alphabetically. You can also keep track of the different products that were purchased on your Products Report. So you know exactly who purchased your custom mulligans, raffle tickets and other products. 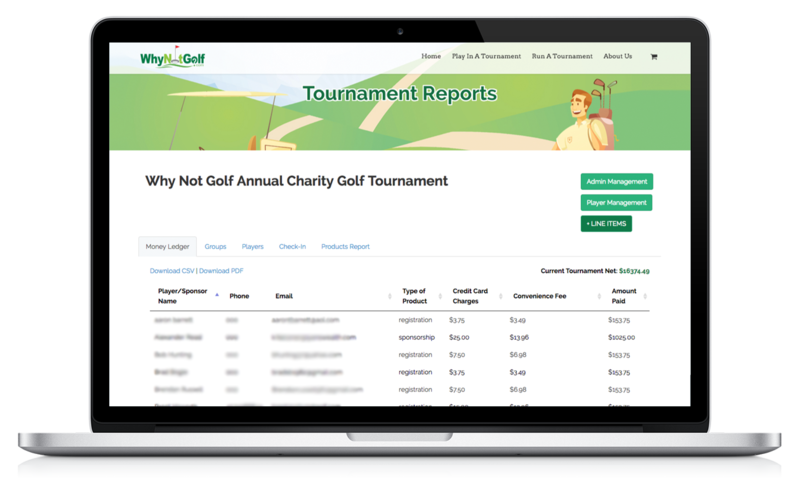 Managing your golf tournament just got easier with our integrated tournament dashboard. 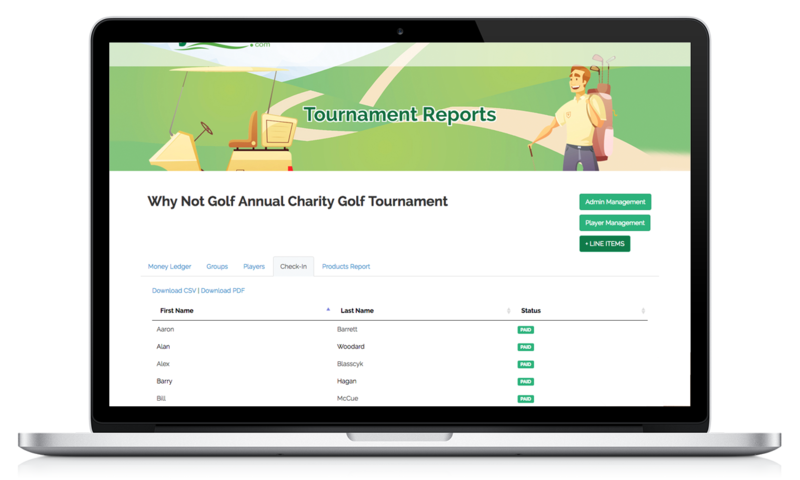 When you log in to the tournament you are managing, you will be able to see all the revenue in real time as well as being able to manage your foursomes with ease. 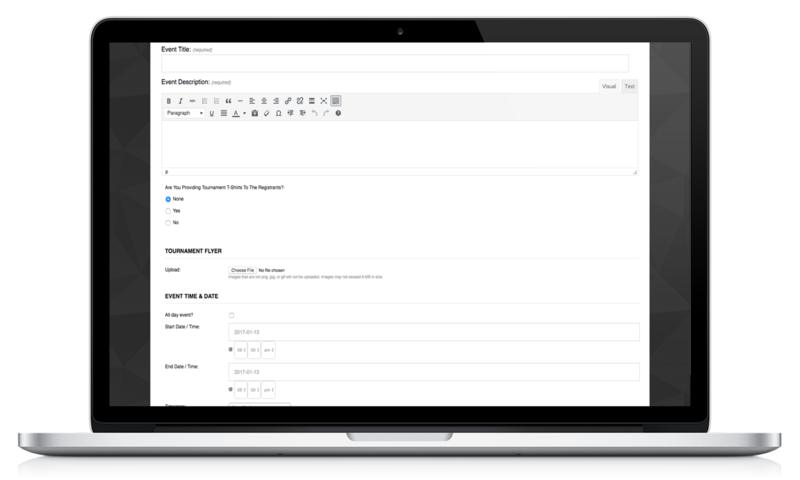 When it comes time to send foursomes to the course, just email them a simple report and it's done! Keep track of all player information to send thank you notes and invite them to next year's tournament.